Please note your reservation is only valid if confirmed from the restaurant. Stay informed and benefit from promotions. You can unsubscribe at any time. Excellent! 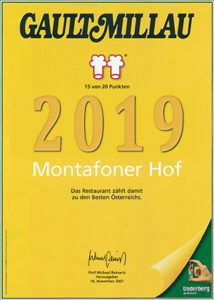 The Montafoner Hof is a regular in leading gastronomic guides and has been receiving awards for years; in 2017 we were awarded two toques by Gault Millau. Our regional food specialties have even taken home extra praise! Hotel Montafoner Hof auf dem Laufenden.